Death by suffocation is nightmarish enough, but boa constrictors do something even more sinister: They cut off your blood supply. That’s the horrifying new discovery of Scott Boback from Dickinson College, whose latest research shows that the powerful squeeze of a boa constrictor halts blood and oxygen flow to the brain within seconds, rendering the victim useless as its organs slowly shut down. 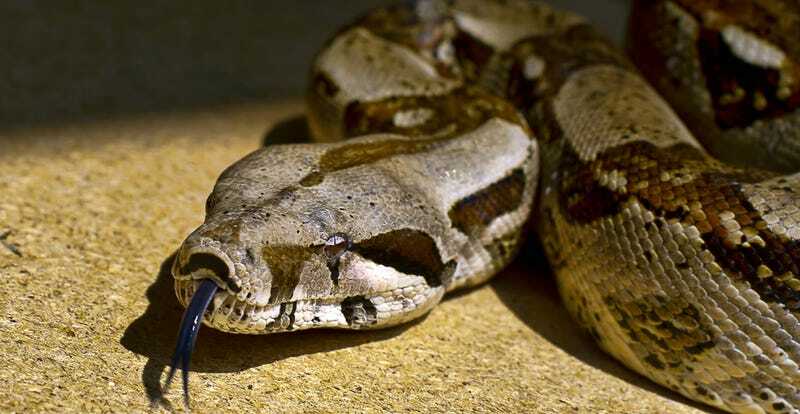 The findings, published this week in the Journal of Experimental Biology, may help explain why boa constrictors are sometimes able to take on prey much larger than themselves. After spending years watching boas kill their prey, Boback began to doubt the long-held assumption that crushing snakes kill by simple suffocation. Caught in the grip of a boa constrictor’s coils, prey animals tend to die very, very quickly. And they’re often gasping for air right up until the end. To find out what else could be going on, Boback and his colleagues sedated a bunch of live rats, inserted ECG electrodes and blood pressure catheters into their bodies, and watched boas devour them (you know, because science!). As the blood pressure and heart rate data streamed in, the team was astounded to discover that circulation shut down within seconds. Many animals (humans included) can survive a surprisingly long time without breathing. But—as boas have cleverly discovered through evolution — not so much without a heartbeat.